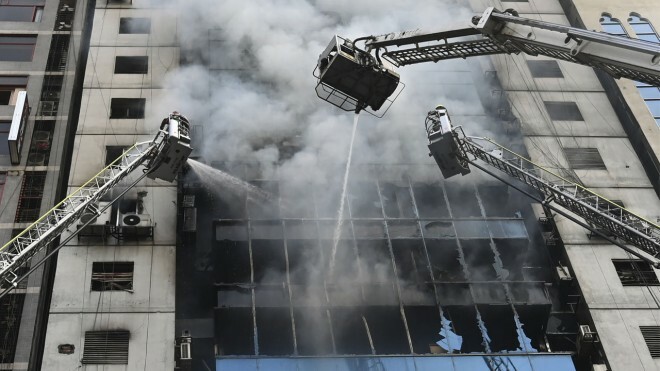 Dhaka, Mar 29: Hopeless workers leaped to their deaths, as a huge fire tore through a Dhaka office block on Thursday killing at least 7 people and trapping others in the latest major blazes to hit the Bangladesh capital. Six people died after jumping from the 22-floor building while another victim suffered fatal burns, officials said. Emergency services said at least 65 people were being treated in hospitals. People were seen screaming for help as hundreds of panicked onlookers crowded the streets of the upmarket Banani commercial district. The misconception erupted barely a month after at least 70 people were killed in Dhaka apartment buildings where illegally stored chemicals exploded. The latest disaster brought new scenes of horror amid fears that the toll would rise. More than 100 ambulances were parked in streets around the building. "When I heard a fire broke out in the building, I quickly rushed out," he said. "Many of my colleagues are still trapped in the office."